From 2001 until 2003 I worked in the Transducers Science and Technology group led by Prof. M.C. Elwenspoek. Supervisor was Dr. G.J.M. Krijnen. Local deposition, preferably under very clean conditions in ultrahigh vacuumsystems, is promising for fabrication of structures with high resolution and of structures of high purity. A technique providing these possibilities is nanostencilling. In this technique thin perforated membranes are positioned between an evaporation source and a sample in a UHVenvironment. The perforated membrane acts as a shadowmask. With the addition of microshutters, selectively and locally covering openings in the nanostencil, many new possibilities can be created depending on the shape of the shutters, the underlying perforation pattern and the dynamic operation during deposition. We developed and tested an active nanostencil. 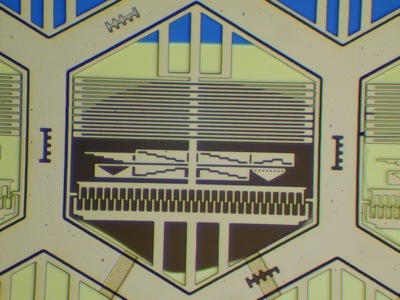 Active nanostencil, consisting of a micromacined comb-drive structure on a thin silicon nitride membrane.